Bike it up this evening with DC Bike Party! Tonight’s weather is just about perfect for March, let alone January, which means that any chance you can get to be out and about in the weather is one you should take. 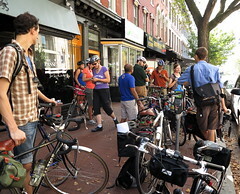 There’s a group called DC Ride that’s meeting tonight at 7:30 in Dupont Circle for a jaunt about town ending at Rendezvous Lounge in Adams Morgan. The ride is free, and there will be a sweet bicycle-mounted stereo powering crowdsourced tunes for everyone to enjoy. The route is available if you get a late start or want to join in process, and please be sure to bring lights and a helmet, as well as a lock for your ride at the party. There’s more info on their rides on their Twitter account, @DCBikeParty, or their website. Enjoy this unseasonable awesomeness on two wheels. If you want to ride, but don’t own a bike, can I recommend Capital Bikeshare? Their bikes are comfortable and speedy enough, and they already have the requisite lights. All you’d need is a helmet and a credit card to make that happen. You’ll likely want to get there early to get a CaBi Cruiser, though, I suspect that’s going to be a popular option. a million bicyclists safely rode in copenhagen today…none had a helmet on…and dc is just as safe to ride aournd in, esp on a bikeshare bike.